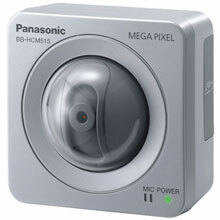 The Panasonic BB-HCM515A has been discontinued. No direct replacement is available. Place the Panasonic BB-HCM515A plug-and-play camera in your home, office, vacation home or almost anywhere else you'd like to keep an eye on things, with no PC required at the location. The camera can be viewed and controlled from a standard Web browser, video display, or even a compatible cell phone or PDA1 and requires no additional software for the PC that you're viewing it on. All of the other required software, including control software (TCP/UDP) and e-mail software (SMTP), is already inside the camera.